This special report contains three parts: In part one Anita Moorjani describes her near-death experience; in part two, Anita is interviewed by NDERF; in part three, Anita responds to a question posted on the NDERF website. 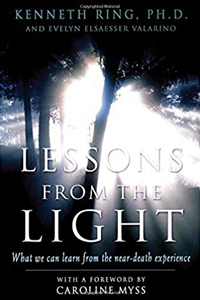 Taken together, this is an exceptionally interesting, informative, and inspiring overview of not just the NDE experience, but how the profound insights gleaned from such an experience can be applied to every day life. A 20 minute video of Anita sharing portions of her experience can be found here. Anita’s complete story appears on the NDERF website and in Jeffrey Long’s book, Evidence Of The Afterlife: The Science Of Near-Death Experiences. The NDERF interview with Anita appears on Anita’s website and the NDERF website. A summary of Long’s book can be read here. I was drifting in and out of consciousness during this time, and I could feel my spirit actually leaving my body. I saw and heard the conversations between my husband and the doctors taking place outside my room, about 40 feet away down a hallway. I was later able to verify this conversation to my shocked husband. Then I actually “crossed over” to another dimension, where I was engulfed in a total feeling of love. I also experienced extreme clarity of why I had the cancer, why I had come into this life in the first place, what role everyone in my family played in my life in the grand scheme of things, and generally how life works. The clarity and understanding I obtained in this state is almost indescribable. Words seem to limit the experience — I was at a place where I understood how much more there is than what we are able to conceive in our 3-dimensional world. I realized what a gift life was, and that I was surrounded by loving spiritual beings, who were always around me even when I did not know it. I know I was drifting in and out between the two worlds, but every time I drifted into the “other side”, I was shown more and more scenes. There was one which showed how my life had touched all the people in it — it was sort of like a tapestry and showed how I affected everyone’s lives around me. There was another which showed my brother on a plane, having heard the news I was dying, coming to see me (this was verified to me as when I started to come round, my brother was there, having just got off a plane). I then saw a glimpse of my brother and me and somehow seemed to understand it was a previous life, where I was much older than him and was like a mother to him (in this life, he is older than me). I saw in that life I was very protective towards him. I suddenly became aware he was on the plane to come and see me, and felt “I can’t do this to him — can’t let him come and see me dead”. Then I also saw how my husband’s purpose was linked to mine, and how we had decided to come and experience this life together. If I went, he would probably follow soon after. Anita Moorjani was born in Singapore and then lived in Sri Lanka until she was two years old. An ethnic Sindhi woman from India, her family then moved to Hong Kong where she grew up speaking fluent Sindhi, Cantonese and English, as well as being conversant with a multitude of cultural idioms. She was educated in English schools in Hong Kong and later studied in England before returning to Hong Kong to take up a senior management position for a French fashion company where she traveled all over the world using her multi-cultural, multilingual background in a variety of business and social settings. In December 1995, she married her husband and soulmate, Danny, who loves her unconditionally (and still does, despite her becoming a NDE freak now). In April 2002 she was diagnosed with Hodgkin’s Lymphoma and after nearly four years of battling the disease, she was taken to the intensive care unit of her local hospital in February 2006 where she was given less than 36 hours to live. Her remarkable NDE and seeming miraculous recovery from cancer has created enormous interest and commentary on an international scale. NDERF: Hi Anita. It’s nice to talk to you again. It’s only been a few months since your NDE and recovery, so I was wondering how are you feeling these days? Has media and public interest in your experience had any effect on your ability to come and go as you please? ANITA: That’s a good question. The most difficult part is not being able now to see this world in the same way as everyone else does. I don’t see things the same way as most people, nor can I process information in the same way I used to. I can’t. It feels like I have seen beyond the illusion of this physical world, and I can’t go back to thinking the way I used to. Sometimes I feel misunderstood. One of my fears is of becoming lonely, should no one understand me. ANITA: When I was in the NDE state, it felt like I had woken up to a different reality. It felt like I had awoken from the “illusion” of life, and from that perspective, it looked like my physical life was just a culmination of my thoughts and beliefs up to that point. It felt like the whole world was just a culmination of mass consciousness. That is, the culmination of everyone’s thoughts and beliefs. It felt like nothing was actually real, but we made it real with our beliefs. I understood that even my cancer was not real, it was also part of the illusion, so if I went back to my body, I would not have the cancer any more. And another thing is that, there was this incredible understanding of how we are all interconnected. And how what I felt within me affects my whole universe. It felt like the whole universe is within me. As far as I am concerned, if I am happy, the universe is happy. If I love myself, everyone else will love me. If I am at peace, the whole universe is peaceful. And so on. Also, there is no such thing as time and space in that dimension. It felt like everything was happening simultaneously. I saw what could be interpreted as past lives, I saw what was happening currently (my brother on the plane, and conversations between my family members and doctors), and I also saw the future of this life pan out. But it was as if they were all happening at once, and I was living them all at once. It felt like, only after coming back, my mind has to process it as happening in linear time, but in that dimension, it didn’t feel that way at all. And distance and solid walls did not stop me from seeing and hearing everything that pertained to me at that time. So now, back into 3D life, it feels like even solid walls and distance only exist because we decide or believe them to exist. ANITA: Well, first of all, my view of the world has totally blown apart. Over these months, I have had doctors telling me, over and over, that what happened to me is completely unexplainable. Medically, it should not be possible. They can’t figure out where the billions of cancer cells went in just a matter of days. Medically, every way they look at it, I should have died. My organs were shut down. Either the cancer should have killed me, the drugs should have killed me, or the billions of cancer cells trying to leave, flooding my shut down system, should have killed me. In view of what physically happened to me, I am no longer able to see any physical disability in the same light anymore! Where, in my own mind, would I draw the line between what is “fixable” or “curable” and what is not? By what scale or logic would I draw these conclusions from? Certainly not from what is “medically” possible! I can’t apply that to my life anymore. The word “impossible” has no meaning to me anymore. The boundaries of what is possible or not is very shady to me. I look at everything in our reality, including things like illness and aging, so differently. I challenge anything that is considered “natural” or “normal”. To me now, everything feels like human construct — that is, just another product of personal and mass belief. NDERF: That’s a really powerful way to live. I want to go into what you say about creating your own reality, but before I do, just while on the topic of the physical body, it sounds as if you no longer see the challenges of illness in the same way — in fact, it almost sounds like you feel “invincible”. Can you elaborate more on that? ANITA: OK, before my experience, one of my biggest fears in life was cancer, another fear was chemo (I watched 2 people die while on chemo), and also I had a myriad of other fears. It was almost as if my life was being “caged” in by my fears. My experience of life was getting smaller and smaller. Now move forward to my NDE. This state caused a huge internal consciousness shift within me. Seeing through the illusion was a big part of it, feeling connected to the entire universe was another part, and becoming aware of being flooded in an all encompassing, loving, energy was also another factor. This was an energy of unconditional love — an energy that does not discriminate or judge. This universal energy is there for us no matter who or what we are. It was in this very awake state that I made the decision to come back into life. It was one powerful decision to come back and experience LIFE in this body again. You see, as soon as the choice to live or die was presented to me, I KNEW that once I made the decision, NOTHING outside of myself could kill me. NOTHING. Just the fact that I was presented with the choice and that I had made the decision, made it real. And as soon as I made the decision, every single cell in my body responded to that decision, and I healed almost immediately. The doctors continued to take tests, but could not find anything. I understood that everything that was being done after that – all the tests, biopsies, drugs, etc. etc. was being done to satisfy everyone around me, and although a lot of it was very, very painful, I KNEW that I would be fine. My higher self/soul/spirit/connection to all that is, whatever you want to call it, that part of me had decided to continue to live through this body, and nothing in this physical 3D world could affect that decision. It felt like any decision made from the real reality far outweighs anything in this “illusion”. ANITA: I strongly believe it is something that can be attained by others. I certainly don’t feel special, or chosen or anything like that, in any way. Perhaps one just needs to be at the right “place” psychologically in their physical lives for something like this to happen. The NDE gave me that last “push” that I needed, to see beyond the illusion. And once I saw that the body is not the real me, and that the cancer was also just an illusion, I was then able to see how loved I am, and I recognized my own magnificence, and once I made the decision to live, the physical body only reflected this “new found” state. I believe that once people are willing to expand their minds to let in such occurrences into their own reality, it may even trigger off further inner work to allow for such a shift to happen within them. I don’t believe everyone has to have to have something as drastic as an NDE to see such miracles occur. Perhaps just a willingness to let go of beliefs which may be holding them back. From that state, where this life looked like an illusion, it looked like our strong attachment to certain beliefs is what holds the illusion in place. Perhaps a willingness to look at and let go of beliefs that may be holding us back could help us to move forward faster, as a mass consciousness. ANITA: From the perspective of the other dimension, it really felt like nothing is real, only our beliefs about them make them so. Now knowing that, I review what I believe, and only hold on to what serves to expand my life, and let go of anything that feels restricting, or doesn’t make me feel positive in any way. My own personal intention is to bring to people’s awareness what our human body is capable of doing, so that they can let it into their belief system. The more people start to believe it, the more we will start to see this kind of thing happening. For example, a miracle is only labeled such because it is an event outside of our belief system. Once we see it happen, we can start to believe it. Once we start to believe it, it can then enter into our own reality and happen more and more often. It’s as simple as that. ANITA: Remember I said earlier that I felt that the Universe is within me? The external world is only a reflection of my internal world! Remember, I believe that this reality is created by mass consciousness. That’s what I felt I broke through, during my NDE. Each of us as individuals ALWAYS has the choice to choose what we want to see and believe as reality. ANITA: I love this question. It gives me the opportunity to talk about the importance of unconditional self love. I would strongly suggest practicing unconditional self love. ANITA: First of all, remember that I feel that the universe is only a reflection of me. So the unconditional love is not extended out to the world (or universe), it is unconditional love that I extend inwardly, towards myself! Each day, I learn to love myself unconditionally. ANITA: I feel it’s my self-dialogue that either elevates or diminishes the energy I radiate outwards. When my inner dialogue turned against me, over time, it depleted my energy, and caused a downward spiral in my external circumstances. I was always really, really positive on the outside, effervescent, loving, etc. etc. and still my world was crumbling around me, and I was getting depleted, and sicker and sicker. Sometimes, when we see someone who is really positive and effervescent and kind, yet their lives are crumbling around them we may think “see, this being positive thing doesn’t work”. But see, here’s the thing. WE DON’T KNOW that person’s own inner dialogue. We don¹t know what they are telling themselves, inside their own heads, day in and day out. Remember, I am not advocating “thinking positive” in a Pollyanna-ish sort of way. “Thinking positive” can be tiring, and to some people it can mean “suppressing” the negative stuff that happens. And it ends up being more draining. I am often misunderstood when I say that each moment is perfect. And that everything is perfect. People are afraid of seeing perfection in a situation that is not of their liking, thinking that seeing perfection means not changing it. To me, seeing perfection does not mean keeping the situation static. It means seeing perfection in exactly where you are in your journey right now, no matter where that may be. Seeing perfection in the journey. Seeing perfection in the becoming. Seeing perfection in the value of the mistakes as you are becoming. Seeing perfection in the moment, wherever in the journey that moment might be. That is seeing perfection. NDERF: This is very powerful — being able to change the exterior in a very positive way, just by changing our internal world with a positive, self-loving, inner dialog. This is a very clear explanation of “The Universe is Just a Reflection of Me”. It also explains why there is so much negativity in the world. It must be a reflection of other people’s negative inner dialogs, being projected outwards. Is that what you feel? ANITA: Yes, that is exactly what I feel. You want to know the best part about feeling this positive energy about yourself? I don’t feel I even have to say anything to anyone to uplift them, but just because of my own loving self talk to myself, people around me feel my positive presence. Without even having to say anything, you will start to notice people being attracted to your positive presence, and be energized by your energy. Your positive inner dialogue helps elevate others around you even when you are not saying anything to them, just thinking positive thoughts about yourself!!!! Because energy just radiates and flows out and touches others!! This is why this self loving inner dialogue is so very important in making a better world. ANITA: In that NDE state, I felt like I was connected to everything. I was everything, and everything was me. It’s something that is so hard to explain, because the right words just don’t exist. It felt like there is no separation, until we come into physical life and look at the world through the mind. In fact, it felt like the separation IS the mind. There was SO much clarity in that state, but somehow, it did not feel like the clarity came from the mind. It’s as if something else was doing the understanding, and that something else was able to identify the mind as being separate, and the mind as being the cause for disconnection from the all that is. It felt like the ego and the mind were one. So in that state, which is beyond the mind, there was no ego and no attachment. And all was one. The connection was felt with EVERYTHING. There was no discrimination and no judgment against ANYONE or ANYTHING. Any crime committed, or any sickness of the body all stemmed from the same thing. All stemmed from a separation and disease of the mind, and is also caused by how the mind interprets the separation. If we are able to stand outside the mind, there is no problem. We are perfect. Even imperfection is the creation of the mind. Judgment too. EVERYTHING. But as soon as we get “into” our minds, we feel a need to process, and see separation in order to understand. But ALL stem from the mind. In truth, we are not our minds. Yet, when in that state, even though I felt one with everything, I still seemed to recognize myself as a separate being from the oneness, as if I had my own evolution. It was like I had this mind, which is not me, but I sort of … had an obligation to “evolve” it as best as I could, but I was OUTSIDE of my mind looking at it. When we are in the physical, we are INSIDE our mind looking out. And the separation between all becomes more glaring and obvious. It felt like all the problems and the issues of the world stemmed from too much mind identification. That is the illusion. The mind is the illusion. But I believe we always have the choice to wake from this illusion. If I become awake, then by extension, those around me are affected accordingly. We can live in this world, but choose not to live in the illusion. We can choose to see right through the illusion and yet express ourselves in the physical. After my NDE, it feels like this illusion is just human construct. A construct of the mind. NDERF: And speaking of “mind,” what are your thoughts on telepathy? Do you see it as mind to mind communication? ANITA: It definitely feels like something from beyond the mind, and not mind to mind. To me, it feels like it’s the connection we have with each other like I described above, the connection with the oneness, the all that is. I feel that we connect with others when we are in touch with that universal connection. Here’s what it feels like for me. Let’s say, for the sake of argument, I am able to telepathically communicate with you. What has happened is that I have cleared my mind, and made it more transparent and become more connected to that universal oneness, and you are doing the same thing. So, you and I are sort of accessing the same pool of “oneness” info. But the reason it feels like mind to mind communication is because here in the physical, we are both communicating and connecting on the mind level. But because we are both accessing the same info at the same time from that oneness pool, and then when we use our mind to communicate with each other, we notice we have both come to the same conclusion, and then we interpret it as our minds have communicated to each other. But actually, we’ve both tapped into the same “oneness” pool. That’s sort of how it feels to me. This is why I feel it is important to keep clearing the attachments of the mind, and make it more open to being connected to this oneness. And then the people who are appropriate for us, will connect with us because they will be at the same level of this clarity, and will be accessing this same oneness pool from the same level we are. People who are closed are walking around in a fog, colliding with others who are also in the same fog, and they are fumbling and struggling along with life. Whereas those with the clarity are transparent, and practically walk right through the ones in the fog. And no one can bump into them or derail them, because they are so transparent and light in their energy. That’s kind of how it feels like to me. ANITA: OK. I am multi cultural and multi lingual. My parents are from India, I was born in Singapore, my grand parents lived in Sri Lanka, but I grew up in Hong Kong, and I had a British education. In addition, when I started working, partly because of my linguistic skills, my work entailed my traveling all over the world. When I was still studying, I was very confused because I couldn’t understand the glaring contradictions between the different religions (because I was exposed to many religions), nor could I understand the glaring contradictions between the religions and the sciences. I couldn’t understand how we could be taught one thing in a religious studies class, about the creation of life, and then learn something completely different, about the same topic, in a science class. I spent a lot of years searching for answers to my confusion, but never found anything satisfactory. Until I had my NDE, that is. Now I don’t search anymore. I still don’t know all the answers, but I don’t feel the need to search anymore. I feel death taught me how to live life. Also, there was a lot of clarity around why my (absolutely wonderful) husband is who he is, and why we had come together. I understood that there was still a lot we had to do together, and that if I chose death, he would follow shortly after, as it felt like our purpose was very linked. It also sort of felt like I would be missing out on a lot of the gifts that life still held for me, as a result of who I had become up to this point in my life if I did not come back. In a way, it sort of felt like…”The work is done. The stage is set. Now just go and be”. Words aren’t adequate, but that’s sort of it. ANITA: Actually, truth be told, it’s because of my Hindu background that I interpreted it that way — as a past life. But in actuality, it felt like everything else I was experiencing in that state. It was all happening simultaneously. So in actual fact, it felt like a parallel life. I also saw my future, and it all felt just as real. Past, present and future. It all felt like it was happening simultaneously. There are certain aspects of my experience that even my own mind sometimes has trouble grasping. But hopefully it will come to me sometime in the “future”, as I expand my own thinking to encompass it. It’s to do with time and space not existing in that dimension. So, in answer to your question, I feel we have to change our concept of time, and how we understand time, to really grasp an understanding of it. It certainly didn’t feel like “consecutive lives” or “consecutive events” the way we understand it here in the physical. ANITA: I sometimes hesitate to use the word illusion, because while we are here, it feels very real, and it’s the only reality most of us know. It can be frustrating for people who feel pain to hear that it’s only an illusion. But that’s not exactly how I mean it. If I may use it in this context, this is what I mean. Bear in mind that during that state, it felt like I woke up into a different reality, a reality where time and space does not exist, and from that perspective, this physical reality looked like an illusion — a dream. It felt like even time is an illusion, which we need in the 3D (physical state) so our mind can process information in a linear fashion. Remember, in that realm, even brick and mortar walls and physical distance did not stop me from knowing what I needed to know. And there was no separation in terms of past present and future either. All was simultaneous. It felt like our physical mind needs to create the “illusion” of time and space in order to process this in a linear fashion. It felt like I had awoken to a state that went beyond mass consciousness, and that the life I had been living up to this point was just an illusion/dream created by my thoughts and beliefs and also a culmination of mass consciousness. It was in this clarity, that I saw that even my cancer was part of the illusion, caused by my mind and who I believed I was up to that point in time. I saw that who I truly am is a perfect and powerful magnificent spiritual being. I understood that no one on this planet is more or less spiritual than another. It’s just whether we choose to acknowledge it or not. And now, I can’t seem to live my life in any other way than with this knowing that there is nothing to forgive, nothing to judge, (these are all part of the illusion — mass consciousness beliefs). And I now feel that “God” is something that is within me, within you, and within every living creature on this planet. So how can we not be perfect? So in answer to your question, I feel that the physical world is set up for us to see imperfection, especially in ourselves. However, the more I look through that “illusion” and can recognize my own magnificence and express it, and the more perfection I see in myself, the more wonderfully I am seeing my life unfold. Remember, I am not saying look for perfection in the world. I am saying, look for perfection in yourself. In your journey and in your becoming. And you will see it reflected back to you in the world. Life has become easier, and I have become much more loving as a result. That is how I see beyond this “illusion”. ANITA: To me, the purpose is BEING. And that is different from being HERE. The focus is different. When the focus is on being here, we can get lost here. The physical world is full of “other people’s version” of life. Whereas when the purpose is BEING, it means being YOU, and only subscribing to YOUR version of life (or creating your version of life). To me, it means being an expression of exactly who I am. ANITA: When we “pursue” externally, we seem to see the world as being competitive and limited, and we use external measures to judge our achievements. To me, herein lies the illusion. There is no limited supply of “beingness”. We seem to measure our “beingness” by the achievement of goals. I don’t, and neither do most people who are happy. My point is to shift your views. See the magnificence in your being whether you are rich, or poor, physically impaired or not, with the one you love, or not, and so on. I am now just focused on being, and am now the creator of my life — that is, the artist of my life. I don’t any more sit and think about the external competition. Each of us is unique, with unique traits and talents. I only have to express my own “beingness” and “uniqueness”. A true artist doesn’t really care about whether there is anyone who can create as well as or better than he. He is too busy expressing himself, purely for the purpose of expressing. He has found something within, and is only expressing his inner beauty, and the world shares in it. The more inner beauty you uncover and express, the more the universe shares in it and reflects it back to you. ANITA: I don’t know for sure, but it sure feels like it can be. I certainly don’t feel “chosen” or more special than anyone else on the planet. Do I feel I can “recreate” this state, now that I have experienced it? The answer would have to be yes. I feel like I am living my life from this state now. In terms of what happened to me, if it can happen to one person, why can’t it happen more and more? How can we, as a mass consciousness, allow it? How can we expand ourselves to allow it? I don’t have all the answers for anyone else except me, because I only know how I process information. I am only able to process how I allow these things to happen to me. However, it does feel to me like an attachment to beliefs, and an unwillingness to let go of them and look at things in a new way is what is holding mass consciousness behind. But hey, that’s just the way I look at things! ANITA: It feels to me now that our “physical” lives have been built around things seeming to be a certain way. Bear in mind, though, that people depend on things being a certain way. Livelihoods depend on it. Our health, wellbeing and safety depend on it. People’s lives are “built” on certain beliefs and their lives work within the framework of everyone around them believing that these things are true. If everyone around you believes in something, you are inclined to believe it too, and think of it as being true. And your life evolves, as a mass consciousness, based on these seeming “truths”. This way of being has been going on for a long time. It has the feel of being solid, with solid foundations. In that 4D state, it felt like, this is how we created this present physical reality — this “illusion”. By everybody believing in the same things. That, in itself, makes it true for the mass consciousness. If we, as a mass consciousness, believed in something completely different, then the world would be a culmination of that collective belief. From that perspective, it really felt like our collective belief created this “illusion” of truth. I want to add here, though, that perhaps the way the world is structured right now, it’s just not ready to know the whole truth. Humankind are not ready for the “illusion” to be shattered. Everything is held in place by everyone believing and thinking a certain way. So if someone came along who is able to see beyond this “illusion”, it is much easier for those still living within the illusion to “shoot” the messenger than to alter this “illusion”. It would cause too much uncertainty and chaos. It can’t be done overnight. Human mass consciousness is not able to come to terms with it. EVERYTHING would have to be looked at differently if people saw through the illusion overnight, and it would cause CHAOS, not peace and love (which those who see beyond the illusion are trying to bring in). Our medical systems, our judicial systems, our education systems, our religious systems would have to be COMPLETELY overhauled and re-evaluated. And it can’t be done overnight. However, those who see through the illusion, see this. And those who see this, become focused in creating a reality for themselves based on their own truths, rather than what has been created by mass consciousness. The universe is changing at the pace that it is capable of changing, that’s why those who see beyond the illusion are able to see the perfection in things being “just so”. The so called “strife” that goes on, the wars, the disparity between rich and poor, the contradictions in religion and sciences, this could be just a natural occurrence of a consciousness that is waking up and starting to see through this man made illusion of mass consciousness. Everything is happening at a pace which is perfect for our fragile consciousness to handle. The way our world is right now, it is not geared up to deal with the REAL TRUTH. The mass consciousness does not yet seem fully ready to handle it. Maybe it never will be. Maybe while we are here, we are meant to deal with things at this level. However, to me, it certainly feels like this ability (to live beyond the illusion) is something that is attainable by the individual, should they choose to do so. My mind is officially blown. My meditation teacher has been saying a lot of what Anita says, but I never really got it. I kind of had my intellect wrapped around it in an abstract way, but Anita’s experience makes it very real. Thank you for publishing this interview. Hi Judith. You’re welcome. I’m glad to be able to share material like this that has the potential to be truly life changing. Two points about Anita’s interview that I found interesting. The second point is a nit I have to pick with the use of the descriptor “perfection.” If everything is perfect, morality and ethical norms do not exist. Illusion, delusion, and abuse are therefore perfect. Consequently, when we say, “everything is in divine order,” we not only justify passivity in the face of injustice, but have no standard to discriminate good from bad. There is no “bad.” I believe what Anita is attempting to convey here is a sense that if you back away from the drama of life enough, everything is harmonious, just as we can see the patterns in a painting when we take our nose off the canvas or the beauty of the Earth from space. Everything looks and seems perfect from such perspectives, and the result can be deep acceptance and inner peace. At the end of account she switches to using “magnificence,” as she does on her website, which I think avoids misunderstandings and an indefensible, naive-sounding position. This is a beautiful, credible, and persuasive account by an articulate and obviously intelligent and caring lady. That’s the big picture, and I do not mean for these comments to detract from that. Thanks Joseph for your comments. I would hope that such beautiful storys as Anita’s one do not lead to a resurgence of the movement of the 70’s that more or less said ‘AHA! you have a disease well you created it!! !’ Such thinking tends to further extrapolate that if you die from an illness you were not SPIRITUAL enough. I believe at this point we need to be reminded, as the old saying goes ‘do not look at yourself too closely because that is NOT who you are!’ We are all part of each other. I believe that many people cross over after an illness because it is ‘their time’ and perhaps they need to move on to their LIGHT BODY’ or perhaps by not being here, in 3D reality, others learn the lessons they need to. We all have MIND LOCKS put on us and that we put on ourselves because of our upbringing social and religious etc .However more and more people are understanding that this 3D Body that we carry around is ‘trapped’in its own limited mind sets. We are coming to understand that ‘All Healing begins in consciousness’ and it is only by truely coming to a KNOWING that we are Multidimensional LIGHT Beings who can move throught many realities that we indeed reclaim our very own Divine Self. Our truely spiritual Journey is to forgive those who put the mind locks on us and to forgive ourselves for limiting our understanding. Your point about ‘the descriptor Perfection’ is very valid and and I think there is a danger is the philosophy of ‘laissez- faire’. Thanks to Anita and for all those who have made her magnificent story available to us. This is truly a wonderful article. I appreciate the opportunity to read it and will share it with friends. God bless you, Anita. You were meant to live and share your journey. I’m going to share this with a large Facebook group that I’m part of. I think everyone will love reading about her extraordinary journey! The self-healing via energy fields is of great interest to me, and to others. Thanks for posting this, David.